Individuals who are living with dementia symptoms and anyone who cares about, works with, interacts with or provides support for them should attend this important conference. Re-Imagining Dementia will bring together the diverse dementia community for collective discussions, interactions and learning experiences. All will gain valuable insights and understanding from the conference. Please mark your selected registration fee. If you have received a registration code, please enter your code here . The appropriate price will appear below. Registration Cancellation Policy – All registration cancellation requests must be made in writing to 424 General Early Drive, Harpers Ferry, WV 25425. There will be a $100.00 processing fee for each refund. No registration refunds will be made after June 6, 2019. Participant substitutions may be made without penalty any time prior to the conference. Requests may be submitted to registrar@OPTPlanning.com, faxed to 304-566-9911 or mailed to 424 General Early Drive, Harpers Ferry, WV 25425. NOTE - Registrants are responsible for cancelling their hotel reservations. Please complete one registration form for each person who will attend the conference. CEUs are included in the cost of the conference. Please let us know which CEUs you will apply for, so that we may provide any special paperwork needed. Each registration includes processing of one individual's CEU application. Conference participants will need to make their own overnight lodging accommodations directly with the Westin Buckhead Atlanta or another hotel of their choosing. Overnight lodging is not included in your conference registration fee. 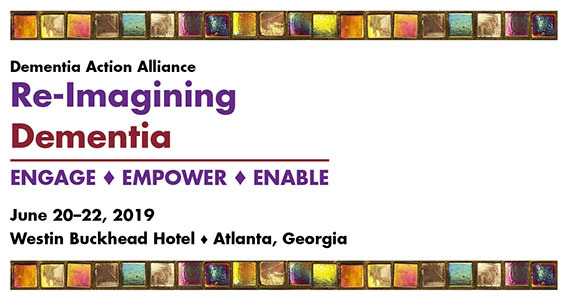 A block of rooms is reserved for conference attendees at the Westin Buckhead Atlanta under the name "The Dementia Action Alliance" until May 28, 2019. To reserve by phone, please call 800.937.8461 or 404.365.0065, or to reserve online, click here. We need your support! Our goal is to provide scholarships to as many people living with dementia who can come to the conference as possible. Your contribution is tax deductible and is greatly appreciated no matter the size. Be a Scholarship Supporter and receive a ribbon for your conference badge recognizing your support! Please make checks payable to the Dementia Action Alliance. The Dementia Action Alliance will not process your registration without full payment. By submitting this form, you are authorizing the Dementia Action Alliance to process your credit card for payment as indicated above. Please note that conference badges and materials will not be mailed in advance and may be picked up on-site at Conference Registration. If you have questions regarding your registration, please phone 681-252-3570 or e-mail registrar@OPTPlanning.com. We use photos for social media and other awareness efforts of the Dementia Action Alliance. Your registration for the conference provides the Dementia Action Alliance the right to use your likeness for such materials.